Modern American foreign policy in the Middle East was formed by three pivotal events: the determination to control the region’s oil resources through public policy and oil corporations after World War I, the decision by Harry S. Truman to recognize the State of Israel within minutes of its proclamation in 1948 and to support it politically and militarily thereafter and the overthrow of a reformist prime minister in Iran, Mohammad Mossadegh, in 1953, in favor of the restored, pro-Western Pahlavi dynasty. Each of these events had profound consequences. Access to cheap Middle East oil-fueled American prosperity after World War II, including the development of a consumption-heavy interstate highway system and its byproduct, dependence on the private automobile at the expense of public transportation. It also contributed to the carbon buildup in the earth’s atmosphere that presents us with our climate crisis. Support for Israel put America at odds with Arab oil sheikdoms, leading in part to the cartelization of oil production by the Saudi-led Organization of Petroleum Exporting Countries in the 1970s. Oil prices rapidly quadrupled, leading to sharp economic downturns in America and other industrialized nations. Israel developed nuclear weapons as a defensive line of last resort. The profoundly unpopular Pahlavi dynasty fell in 1979 to a revolution that installed a regime of clerics dedicated to the Islamization of Iranian society, opposition to the Great Satan of the United States, and the destruction of Israel. America’s reaction to these events was threefold. Relations with Saudi Arabia were renegotiated, and attempts were made to resolve the long impasse between Israel and its Palestinian neighbors — the most pressing though not the ultimate irritant between Israel and the Muslim world — by the creation of a Palestinian state. The Carter and Reagan administrations supported a bloody war between Iraq and Iran as a means of containing the latter. Meanwhile, American military forces were reinserted in the Middle East for the first time in a generation, resulting in devastating wars and a succession of failed states that have destabilized the Muslim world from North Africa to Pakistan. Through all this tumult, the single constant factor was dependence on Middle Eastern oil. Lately, however, this dependence has been significantly eased by the exploitation of shale oil deposits in North America made accessible by fracking. In crude terms, we don’t need the Middle East anymore, and, with the failure of the Arab Spring movement after 2011, we can afford strategically to leave it to its ancient hatreds and quarrels. The policy of the Obama administration broadly reflected this, although three more states, Syria, Libya and Yemen, were destroyed on its watch, and an effort was made to contain Iran’s nuclear ambitions. Donald Trump raised the question of American investment in the region even more pointedly during his presidential campaign. Why, he wondered, was America still fighting a decade-and-a-half-old war in Afghanistan? Why, furthermore, should we care about factional quarrels in Iraq, or the Syrian civil war? Why were we currying favor with Iran, a country that continued to spew hatred at us? After a century of American misadventure and mischief in the Middle East, Trump’s questions were fairly raised, even if from a fund of surpassing ignorance and gross stupidity on his part. They led to no debate, partly because he had no serious interest in them; they proceeded merely from his desire to lob grenades at the political establishment and his America-First isolationism in general. As for those with a vested interest in American policy, from the military-industrial complex to regional client states and other suitors for American largesse, there was no desire at all to disturb a profitable status quo, however costly or disastrous to others. The silence of these groups did not mean disinterest in Trump’s challenge; the very stupidity he exhibited made him a mark, and the even slight possibility that he might be elected president made him unwise to ignore. Israel’s Prime Minister Benjamin Netanyahu, who had daggers drawn with the Obama White House over its Iran policy, was the first to realize this, and Netanyahu has reaped for the moment rich if dubious rewards: a renewed and augmented security agreement; the American embassy’s move to Jerusalem; a surge in American Evangelical support for Israel as a Jewish state. Not long ago, this would have cost Trump most Arab support, but, thanks to the feckless policy of his predecessors, Iran has become a regional hegemon, raising the specter of a revived Persian empire and with it the age-old struggle between Shiite and Sunni Muslims to define Islam itself. This contest has forged an alliance of convenience between Saudi Arabia and Israel, enabling American policymakers to support each without unduly antagonizing the other. The American policy establishment has tried to walk a fine line between support for the Sunni coalition and buying Iranian good behavior with relief from economic sanctions. It hasn’t worked with either side; Tehran continues to build an unbroken geographical corridor to the Mediterranean while the Saudis resist any Iranian advance. Meanwhile, the Saudis and their clients have taken a page from Israel’s playbook in dealing with Trump. 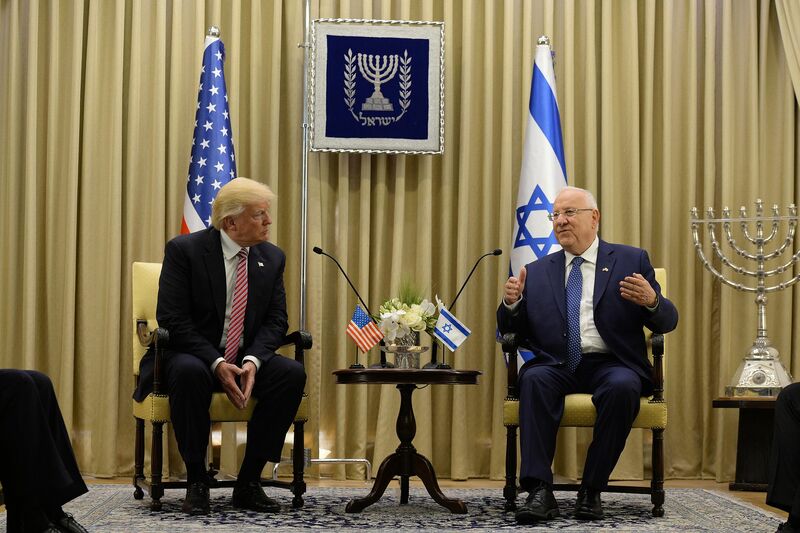 Superficially, Trump has continued America’s Middle Eastern policy, with the major exception of his repudiation of the multinational pact to freeze Iran’s nuclear arms program negotiated under Obama. In fact, however, his policy is driven by a single overriding goal: personal power and profit. Israel couldn’t offer him monetary value, but in embracing the Evangelicals’ support of it as the harbinger of the Second Coming, it has appealed to a broad segment of his political base at home. The Saudis and the United Arab Emirates have bought his patronage with a mixture of flattery and hard cash. The extent of the latter, and of the covert Arab support of his presidential campaign, is only now coming to light. Simply put, Donald Trump regards the presidency as a marketing opportunity for his business empire, and American policy consists now of supporting those who serve it, opposing those who do not, and ignoring those who have no offer to make. This is not entirely unprecedented; the Bush clan was notoriously tied financially to the Saudi monarchy. Never before, however, has national policy been so nakedly sold for private advantage. Trump recognizes no distinction between policy and profit; he runs the country, as he runs his business, solely in terms of what’s in it for him. It’s more in his case than simple greed, though, since he makes little if any distinction between his ego, his wallet and the world, he is not merely corrupt but in a more encompassing sense depraved. What’s good for Donald, then, is currently what’s good for America. Has any great country ever disgraced itself more?